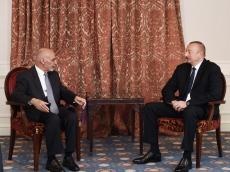 Azerbaijani President Ilham Aliyev has met his Afghan counterpart Mohammad Ashraf Ghani in Brussels. Ilham Aliyev recalled with satisfaction the visits of Mohammad Ashraf Ghani to Azerbaijan and the meetings held so far. President Ilham Aliyev said that the meeting of the International Contact Group on Afghanistan was successfully held in Baku and good discussions were held. Mohammad Ashraf Ghani once again conveyed congratulations to Ilham Aliyev on the occasion of his reelection as president. Mohammad Ashraf Ghani once again expressed gratitude for the continued support by Azerbaijan to Afghanistan in various fields, and also for the fact that Azerbaijan held the meeting of the International Contact Group on Afghanistan. At the meeting, the sides noted successful cooperation in various fields between the countries and the support rendered by Azerbaijan to Afghanistan in the humanitarian sphere was emphasized. During the conversation, an exchange of views on regional issues took place. Azerbaijan’s special role in restoring peace in Afghanistan was noted. At the meeting, the parties also discussed prospects for cooperation in the economic sphere between the countries.